For years, the push to do something about Alzheimer’s disease focused almost entirely on drug development. Find a cure. Develop a vaccine to prevent the disease. Develop a drug to “manage” people who live with Alzheimer’s and other types of dementia. What many people weren’t noticing, however, was that in tandem with this effort was a quiet revolution doggedly moving forward. Long championed by Dr. Bill Thomas of Changing Aging among others, the thinking behind this movement has always been to recognize that people living with Alzheimer’s and other dementia were first and foremost people. Developing dementia doesn’t take away your individuality or humanity any more than developing cancer or diabetes. Therefore, rather than concentrate only on drugs, we need to help caregivers – and yes professionals – better understand how to help people living with dementia cope with the negative aspects of their illness so that they can live the best life that they can. No two people with Alzheimer’s present symptoms identical to someone else. It is a disease of individuals and should be treated as such. 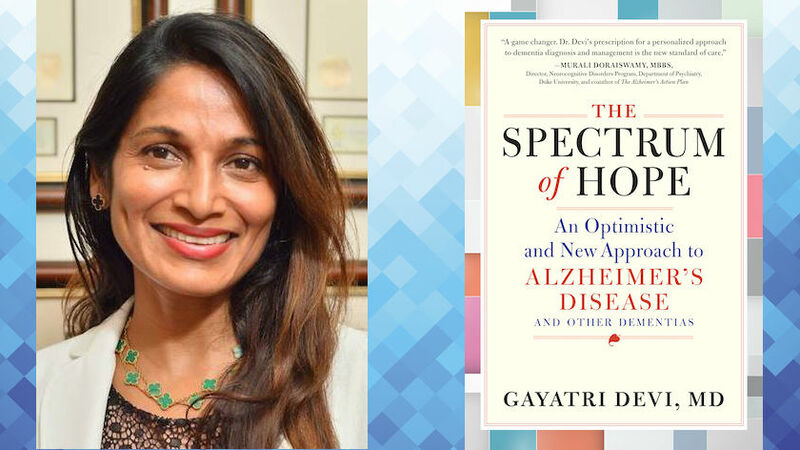 “The Spectrum of Hope: An Optimistic and New Approach to Alzheimer’s Disease and Other Dementias,” written by Gayatri Devi, M.D., represents an exceptional effort to support the second movement and expand on it. Dr. Devi, a board-certified neurologist, is Director of the New York Memory and Healthy Aging Services and an attending physician at Lenox Hospital/Northwell Health. In addition to her compassionate advocacy for people living with Alzheimer’s, Devi expands on the idea that Alzheimer’s is a spectrum disorder, which would explain why no two people with Alzheimer’s present symptoms identical to someone else. It is a disease of individuals and should be treated as such. Devi’s book spans what can be a divide between championing the person who lives with dementia and supporting the caregiver in what is an incredibly challenging role. Because of her compassion for both people living with dementia and their caregivers, The Candid Caregiver felt that we needed to follow up with Dr. Devi. This interview, which has been lightly edited for length and clarity, is the result of our email interaction. The Candid Caregiver: There have been many theories about why people with Alzheimer’s disease differ so much from one another but your theory that Alzheimer’s is a spectrum disease hits home with me. Could you give us an encapsulated description of what you mean? Dr. Gayatri Devi: There are at least three different types of Alzheimer's based on the brain regions affected by the pathology, meaning the plaques and tangles of the condition. Then, based on cognitive testing, there are as many as seven different types of Alzheimer’s present, perhaps even more. Depending on the type of Alzheimer's a person has, he or she may progress rapidly, slowly, or very little to not at all. Additionally, depending on the type of Alzheimer's, the response to medication and treatment is also going to be different. TCC: "Spectrum of Hope" is packed with sage advice for caregivers but one thing that especially jumped out at me was this: “Don’t lose your loved one to the disease.” I agree that losing our loved one to the disease, or as some would say, letting Alzheimer’s define our loved one, is not that hard to do. Could you expand on that for us? Dr. Devi: Each of us has our own preferences, our own skill sets, and our weaknesses. We bring these with us into our Alzheimer's. I may be someone who likes to dance, is not particularly organized, and preferd chatting to reading books. Alzheimer's doesn't change their preferences unless it affects those parts of my brain. Trying to change me into an organized bookworm may be helpful but it is not who I am. Enjoy my chattiness and enjoy the special relationship we have. Don’t lose this "me" should I develop Alzheimer's or really, any other type of chronic illness. TCC: One pull-out for a book chapter reads, “I’d have to be crazy not to be paranoid!” This is incredibly insightful. We as caregivers understand the best we can what it’s like to live with Alzheimer’s but no one who is not living with the disease can truly comprehend the core of it. Still, we make that attempt. What is your number one piece of advice for caregivers trying to comfort a loved one displaying paranoid behavior? Dr. Devi: Paranoia and/or aggression in someone with Alzheimer's come from fear, anxiety, and insecurity. Addressing the underlying concerns that are causing the fear, anxiety, and insecurity is the best way to help someone living with Alzheimer’s through these hard times. TCC: You address one of my favorite topics when you talk about safety versus independence. As a columnist, I try to communicate the idea to caregivers who ask me about this issue that without some feeling of choice and independence, many people wouldn’t feel that their life is worth a whole lot. How do you help your patients’ families and caregivers find a balance that protects dignity through encouraging choice while still recognizes the fact that someone living with Alzheimer’s – especially the later stages – could impulsively do something incredibly dangerous? Dr. Devi: This is a lovely question on your part, thank you for asking. It is a balancing act, getting caregivers to acknowledge that independence is key to feeling like an adult, to living rather than existing. I often make analogies to relationships in general. One person may be a risk-taker while their spouse is cautious. One likes to bungee jump, the other to play bridge. There is risk in every aspect of living. It’s no different when someone has Alzheimer’s. One thing that can be addressed is the fear that caregivers often have of losing track of their loved one living with dementia. There are common-sense steps that can help, such as making sure there is a tracking device or bracelet on the person at all times. This allows the person living with Alzheimer’s more independence while providing some peace for caregivers.